Public Service Commission, West Bengal has released the WBPSC SI Application Form 2018 for the recruitment to the post of Sub-Inspector in the Sub-ordinate Food & Supplies Service, Grade-III, under Food & Supply Department. WBPSC SI Application Form 2018 has been released online at www.pscwbonline.gov.in. Candidates can do the registration before the lapse of the deadline. The application form has been released on August 22, 2018. Recruitment will be done on the basis of Written Test and Personality Test. From this page, candidate will get full updates regarding WBPSC SI Application Form 2018. Latest: WBPSC SI Application Form 2018 has been released candidate can check the same from below given link. Before applying for WBPSC SI Application Form 2018 candidate should go through the eligibility criteria. Candidate should mention the correct details in the Application Form. For more details regarding Application Form candidate can through the below-mentioned table. Apply Online: Click here to fill WBPSC SI Application Form 2018. Rs 110/- + 1% Service Charge of Examination Fee + Rs.5/- for online payment through debit/credit card + Service Charge /GST as applicable (Govt. Duty) or Service Charge of Rs.5/ only for Net Banking or Service Charge of Rs.20/- for payment through Bank Counter (off-line payment). 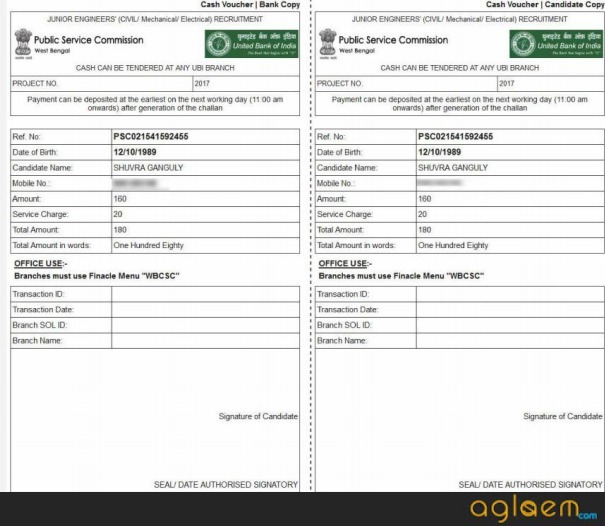 How to fill WBPSC SI Application Form 2018? Candidate can fill the WBPSC SI Application Form 2018 by following the below-mentioned steps. Click at the link in which Application Form for Sub-Inspector in the Sub-ordinate Food & Supplies Service, Grade-III, under Food & Supply Department is mentioned. Step1 (Registration): Firstly click on the ENROL YOURSELF button. Once the candidate will click at ENROL YOURSELF button Enrollment Form will open. 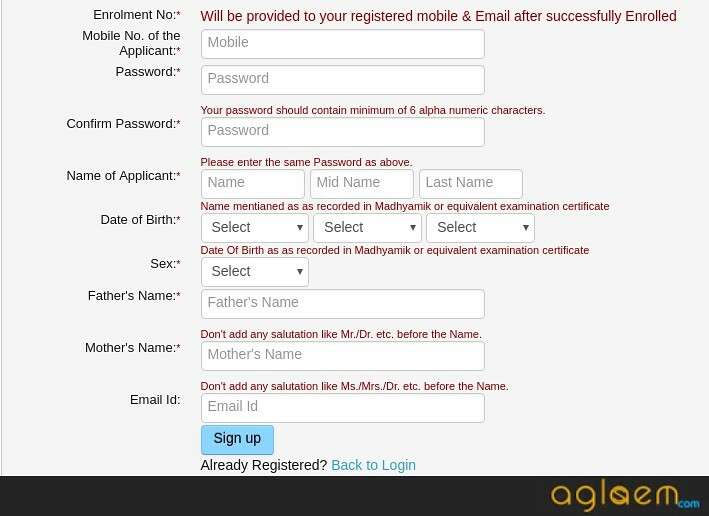 Fill the asked details like Name, Email ID, Mobile Number, Father’s Name, Mother’s Name etc and after filling all the details click on the sign in button. After clicking at the Sign-Up button. 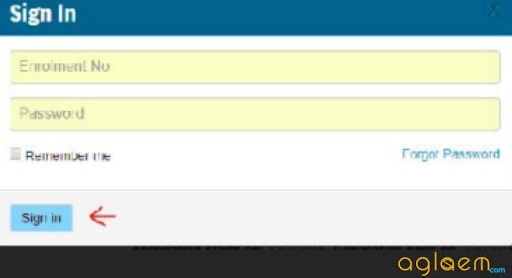 Confirmation Page will open, the candidate should read the filled information and click on the confirm button. Candidate will receive OTP at their registered mobile number for verification. 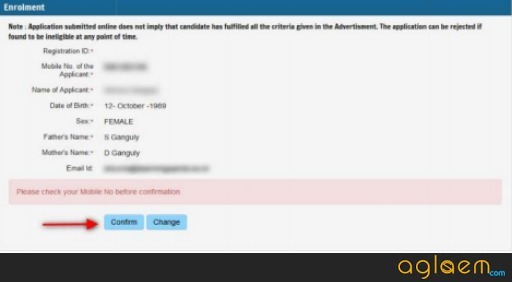 Candidate should mention the correct OTP and click at Validate OTP button. 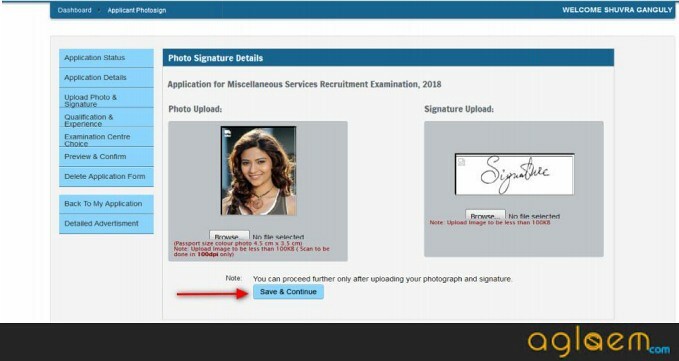 After successful validation of the candidate, on the screen Enrolment Successful Message will be displayed at the Application Portal. 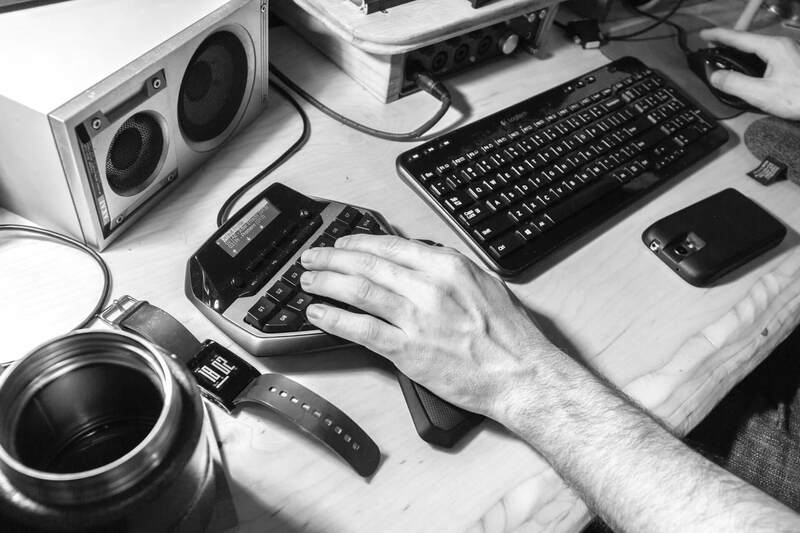 Click on the Sign-Up button. After clicking at Sign in button Dashboard page will appear from their click at the Application Form tab. After clicking at the Application Form tab My Application Form page will appear. From My Application Form page click at the Check Eligibility tab. 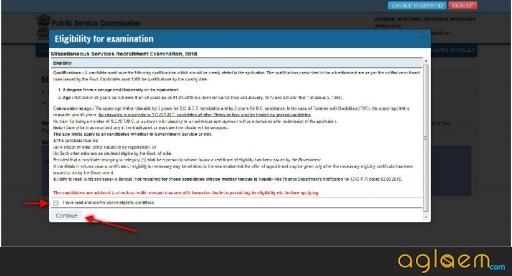 Eligibility criteria tab will get open on the screen after reading the eligibility criteria click at the continue tab. Step 2: Application Form page will open, once the candidate will select at the Application details tab. Application Form filling page will open. 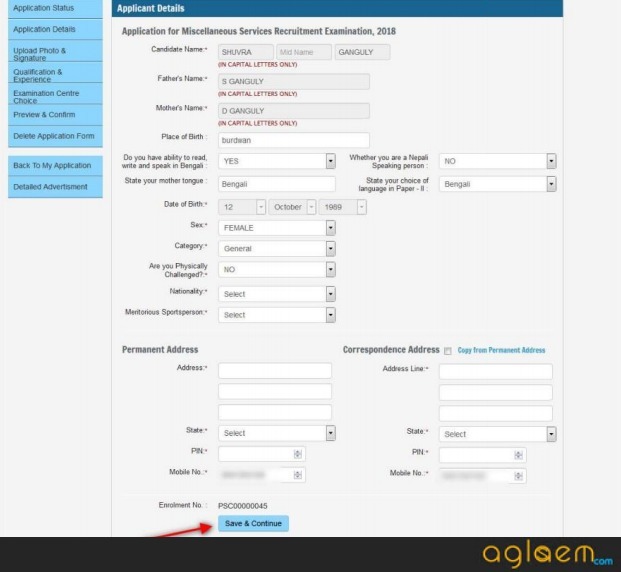 In the Application Details, page candidates need to enter the personal details, contact details etc. After mentioning all the details click on the Save & continue tab. Step3: After clicking on Save & continue tab Uplodation page will open, on that page candidate need to upload the Photograph and Signature. After uploading all Photograph and Signature click on the Save & continue tab. 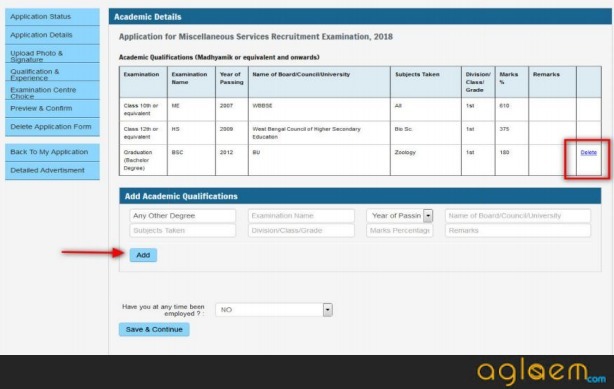 Step4: After clicking at Save & continue tab Academic Qualification Filling page will open, on that page candidate need to mention about their Qualification details. After filling all the details click on the Save & continue tab. Step 5: After clicking at Save & continue tab Choice of Examination Center page will open. Candidate needs to choose the 3 examination center as per their preference. After filling the Examination Center click on the Save & continue tab. After clicking at Save & continue tab Application Form view page will open. Candidate should read all the mention details in the Application then click on the My Application tab after click on My Application Form page My Application page will open from there click at the Make Payment Tab. Step 6: After clicking at My Payment Tab Select Examination for Payment page will open. Online Payment: If the candidate will select Continue Online paymnet tab then the candidate can do the payment by using Credit Card, Debit Card, Internet Banking. Filled the asked details for doing the Online Payment and click on the Pay Now & Submit Application taSub-Inspector Recruitment 2018b. 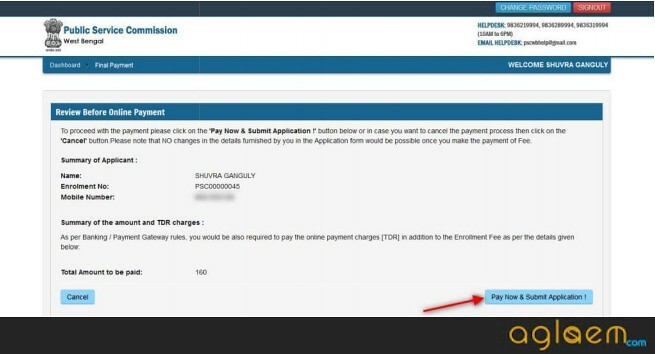 Offline Payment: If the candidate will select Cash Payment through UBI Bank tab then the candidate has to click on the Generate & Print Challan option for generating United Bank of India Challan. After generating the Challan click at the Print Button.